Why Wear White Wedding Gowns? Most brides choose white wedding gowns over any other color. White weding gowns are considered traditional, but it's history is relatively recent. Wearing white on the wedding day actually started as a fashion fad! Wearing white wedding gowns gained popularity when Queen Victoria of England married Albert in 1840. She wore a white gown to incorporate some lace that she owned. After that many women copied her, and wore white on their wedding day - a fashion trend that continues to this very day. However, there are a few brides out there who choose to incorporate some color into their wedding gown. I have compiled a few fashionable wedding gown looks that show this new trend. I call them wedding gowns with a touch of color - because the gowns are essentially white, in keeping with tradition, yet allows for subtle incorporation of bright colors. Have a look! Touch of striking green in the train of this lovely dress. The green is also visible from the front of the dress in the form of a sash around the waist. This is an unusual and bold piece - that's probably why it would suit a bride looking to make a grand statement on her wedding day! The vibrant red flower motif on the white gown is certainly eye-catching. The inner skirt layer is made of tulle, which make the skirt appear full. Something new, something old, something borrowed and something blue...One great way of incorporating something blue into your wedding gown, is to simply tie a complementary blue sash around the waist. 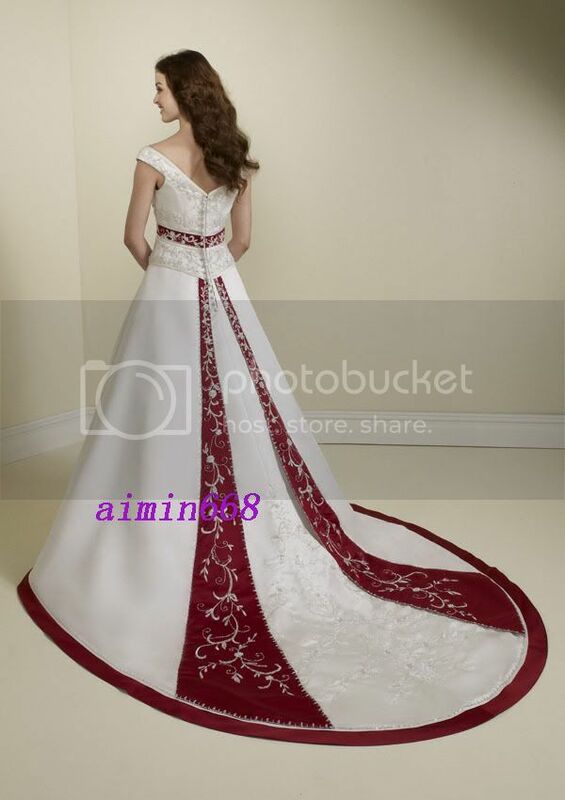 This wedding gown has a bold red border along the hemline of the skirt. And the touch of red is also all over the train of the wedding gown.